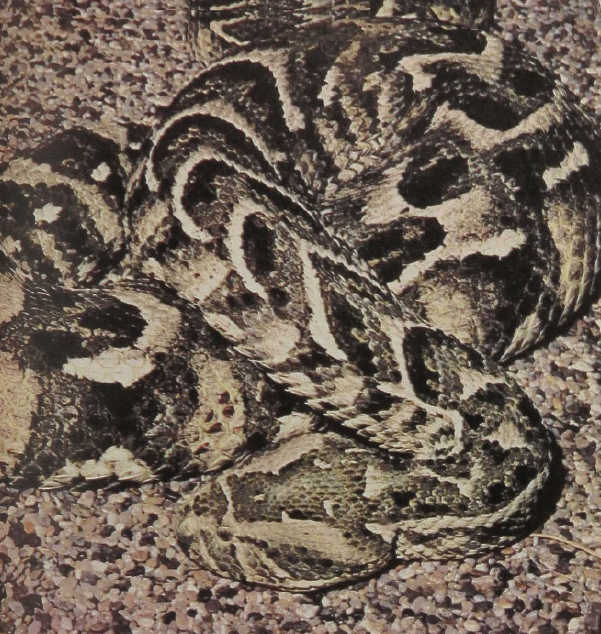 The Puff Adder is one of the largest African vipers but a little smaller than the Gaboon Viper. Some six other, mainly smaller, species of the genus occupy other portions of the continent. The Puff Adder ranges across all of Africa, from the Cape almost to the Mediterranean. Unlike the Gaboon Viper, the Puff Adder occupies subdeserts and savannas and also ascends mountain ridges. Both of these large snakes often move by rectilinear locomotion, sliding in a straight line like a caterpillar. The highly potent venom of the Puff Adder lacks the neurological component of the venom of the Gaboon Viper: it produces severe tissue destruction. The young are born alive in litters as large as those of the Gaboon.